PG&E provides some of the nation’s cleanest energy, including a growing supply of renewable energy sources such as solar, wind, geothermal, small hydro and various forms of bioenergy. In fact, more than half of the electricity we deliver to our customers comes from greenhouse gas-free resources. In 2014, we reached an important milestone; we delivered 27 percent of our power from eligible renewable resources and stayed on track to meet the state’s ambitious clean energy goals. We use a variety of approaches to achieve California’s renewable energy goals, including using competitive solicitations to procure renewable energy from third parties and owning renewable energy projects ourselves. As we grow our clean energy portfolio, we work collaboratively with regulators, environmental organizations and other stakeholders to do so in a way that is affordable for our customers. California’s Governor recently signed Senate Bill (SB) 350, which increases the state’s Renewables Portfolio Standard (RPS) to 50 percent by 2030. PG&E has made significant contributions to the state’s progress and is well on our way to meeting California’s prior renewable energy target of 33 percent by the end of 2020 ahead of schedule. PG&E supported SB 350 and the flexibility the new law provides on banking of excess renewable energy procurement, which will provide for greater opportunities to secure the best renewable energy pricing available on the market for our customers. Topaz Solar Project. This project, built by First Solar for MidAmerican Energy Holdings, is one of the world’s largest solar photovoltaic (PV) projects. It reached its full 550 MW capacity in 2014. Mojave Solar. Abengoa’s 250 MW concentrating solar project completed construction in 2014. The project, which utilizes parabolic trough solar thermal technology, is located near Harper Dry Lake in San Bernardino County. Ivanpah Solar Electric Generating Station. The Ivanpah solar “power tower” plant uses fields of 170,000 heliostat mirrors focused on a central receiving tower and became operational in 2014. The 377 MW project will power 140,000 typical California homes; PG&E contracted with two of the three units for a combined capacity of 248 MW. PG&E is well on its way to meeting California’s renewable energy mandate. By the end of 2014, 27 percent of the electricity we delivered to our customers came from RPS-eligible resources. California’s RPS is measured by the percentage of total retail sales that come from RPS-eligible resources. The majority of the renewable resources will come from contracts with third-party renewable energy companies. Overall, PG&E has contracted for more than 10,800 MW of RPS-eligible energy since the start of California’s RPS program in 2002, including more than 6,500 MW of active contracts through 2014. Approximately 5,600 MW of these are delivering energy to PG&E, with about 900 MW under development as of December 31, 2014. 1 Includes new RPS procurement through the RPS, RAM, RAM for PV Program and PV RFOs. Excludes terminated and expired contracts. PG&E also saw growth in the number of signed contracts from its Feed-In Tariff (FIT) program, which offers a standard form contract and payment for renewable projects up to 3 MW within our service area. 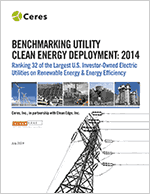 In 2014, we executed 14 FIT contracts, representing 19 MW of RPS-eligible capacity. PG&E continues to participate in multiple forums to help shape sound energy policy solutions to meet the challenges California faces with respect to renewable resource development and interconnection. For example, PG&E continues to work with the CPUC as the agency implements California’s RPS legislation and other renewable energy programs. PG&E believes there is a need for more broad-based policy solutions that can optimize GHG reductions across multiple sectors. Renewable resources are just one of several ways to achieve GHG emission reductions. Energy efficiency, demand response and cap-and-trade programs will also help the state meet its GHG reduction goals. PG&E supports policy frameworks that encourage a transition to a lower-carbon future while maintaining or enhancing safe, reliable and affordable electric service.